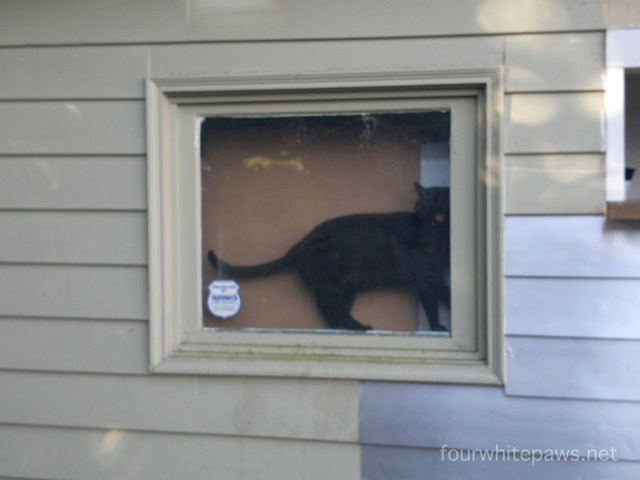 fourwhitepaws: how much is that cat in the window? I've shared many times how much I worry about Oliver's well-being. Anytime he doesn't show up when expected I really begin to worry. Yesterday morning was one of those mornings. Oliver is always around for his breakfast of warmed wet food. Pierre and MK were present as they typically are but Oliver was unusually missing. All morning I kept watching for him but no sign. As the hours passed my worry escalated. My mind raced back to the last time I saw him, which would have been sometime Monday afternoon. When I arrived home late on Monday night, I saw two black cats in the alleyway. I watched in horror as the smaller black cat ran away from my car and was about to dart out across the busy street but put on it's brakes just in time to avoid an approaching car. The other cat ran behind my garage. I couldn't be sure but I think the cat that went behind the garage may have been Oliver. Oliver was in the garage window, meowing at me to get my attention! "Hey!! Over here!!!" He had somehow managed to squeeze between the sheet metal curtain and the glass. I would have never thought to look in there, so it was good he was in the window. After I got home for work Monday night, I had popped into the garage for a few seconds, just enough time to turn off the light that had been left on and apparently was all the time he needed to run in. Poor guy, being locked away for the night! I'm so thankful all the horrific scenarios that had been coming to mind earlier in the morning didn't come true. He'll be getting extra loves this morning to make up for the one's he missed. Oliver, stop giving your human early grey hair! Glad he's okay and that he was locked up only one night! It is so hard to keep track of the outside kitties. Glad you found Oliver! I had a couple that just disappeared into thin air - no bodies, nothing. I assume some animal got them as they were small and only 6 months old. It is a rough life out there. Outdoor cats can worry you to pieces. yep - that will scare you. Mom worries about our outside girl too when she doesn't see her (Allie was present and accounted for this morning). Good thing Oliver found the window!! Poor baby! Glad he is present and accounted for. I could not have outdoor cats...I'd be a nervous wreck. Oh silly Oliver! If you have to go in, go in somewhere the humans are all the time! Mom said she know how you feel when Oliver wan't there. When I came home late, that what my mom feel. And " meow " from kitty it means a lots to mom. It's a special bond. Make me & mom overwhelm . And we feel so release & happy to know Oliver came home & safe ! We are glad to hear Oliver is okay, too! One time, one of my indoor cats went between my legs out the door outside, and I did not notice. After not seeing him all day long I began to look around. He was patiently sitting outside the back door, covered in prickly seeds, which took a long time to get out. RE:/your comment on my blog. I think "they" (I won't name names) want to hack into your webcam. I clicked on your blog a bunch of times--maybe I will be at the top today!!! Awwww! Poor kitty! I'm glad everything turned out OK! And I hope you are having a good weekend! Thank goodness. I know that fear and worry and love. We all of us have it who love cats.